What Senator Sessions knows is of no interest to me. It must be vast. But what he doesn’t know about Robert Frost is of abysmal proportions, a stark and humiliating metaphor for all that is wrong in the United States today. And this is catastrophic. Good fences make good neighbors? Please Senator, try not to be absurd. Don’t make me cry out loud! Are you serious to assert on the floor of the United States Senate that Robert Frost suggested such a claim? And did not one of the senators from Massachusetts rise to the poet’s defense? After all, Frost hailed from those parts — a Harvard man, too. Don’t make me laugh out loud! Sessions quotes Frost out of complete context, negating the meaning of Frost’s great poetic expression of tolerance, friendship, and rationality. But what can one expect? The senators are politicians, and they are true to their nature, like the hardness of stones, for example. Using a quote from a Frost poem to drop yet another stain on the reputation on the United States, this time walling out Mexico, is a gross malfeasance by Sessions and by all those who stood to pass the “Senate fence measure.” The poem, “Mending Wall,” was written by Frost in 1914, but his ideas are as fresh today as “spring mending-time.” Obviously Sessions was too busy keeping America secure to read the poem through. But this is in keeping with the longstanding tradition of our politicians not reading anything through . . . like the Patriot Act, for example. But surely Sessions could have taken the trouble to read at least the first line! See how ridiculous your statement is, Senator? Would you care to issue a retraction? Below is the complete poem. I defy anyone to find a kind word in it about the human value of building walls or fences. Dark-minded, stone-age thinkers who never venture a thought beyond their own closed-in minds might, but of course Frost skewers them. And that’s the point of the poem. Read it and weep for your country. 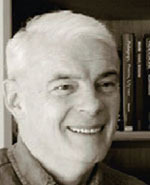 James C. Ryan is a co-founder of West Point Graduates Against The War. He is a graduate of the United States Military Academy, class of 1962. Ryan spent five years in the army artillery with assignments in the United States and Europe. Thereafter a businessman, he subsequently became a writer. He divides his time between Istanbul, Turkey where he lives, and New York City where he teaches in the summer at Columbia University. Father of four, Jim has eight grandchildren.